Halve the potatoes and toss them into a large baking dish. Season with salt and pepper. Meanwhile, put the cream, butter, herbs and garlic in a small saucepan and bring to a simmer over medium heat. Cook for about five minutes to infuse the cream with flavor. Season with salt and pepper. Pour the hot cream mixture through a strainer over the potatoes. Discard the herbs and garlic. If there is not enough cream to go three-quarters of the way up the potatoes, pour some additional cream on top to make up the difference. Sprinkle the parmesan cheese evenly over the top. Bake for 30-35 minutes, until the potatoes are cooked through and the top begins to brown. Cover and keep warm until ready to serve. In Recipes-list.com we have selected the most viewed recipes from category - uncategorized . Enjoy the best recipes specially selected for you! 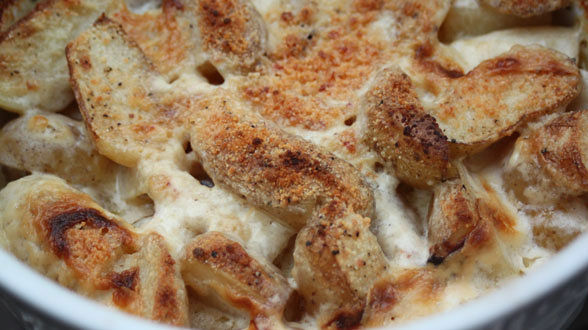 Autumn Potato Gratin is the right choice that will satisfy all your claims.